Juliana Huxtable is an intersex and transgender visual artist, performer,writer, and DJ. In her multidisciplinary career she often conveys her ideas through a afrofuturist lens blended with modern science fiction. This piece brings together parts of her identity that she wants to draw attention to via a sexualized position to celebrate her body and identity in her surroundings which recall Nubian and Egyptian settings. “Juliana Huxtable | Untitled in the Rage (Nibiru Cataclysm) (2015).” Artsy. https://www.artsy.net/artwork/juliana-huxtable-untitled-in-the-rage-nibiru-cataclysm. Sargent, Antwaun. “Artist Juliana Huxtable’s Bold, Defiant Vision.” Vice. March 25, 2015. Accessed July 19, 2018. https://www.vice.com/en_us/article/exmjkp/artist-juliana-huxtables-journey-from-scene-queen-to-trans-art-star-456. “Untitled in the Rage (Nibiru Cataclysm).” Guggenheim. July 17, 2018. Accessed July 19, 2018. https://www.guggenheim.org/artwork/34476. 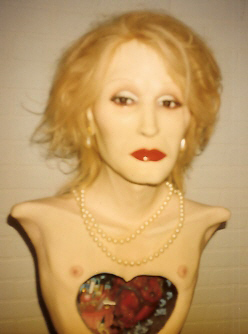 Significance to Queer Art History: Candy Darling, a transgender actress who was featured in several of Andy Warhol’s films was one of Lankton’s icons that she also looked up to as a trans woman. Inside the bust is a valentine-style heart next to a human heart that Lankton has fabricated. This could allude to the idea that, as a friend of hers, Julia Morton writes: “the artist’s life was sustained as much by fantasy as reality”. Morton, Julia. “Greer Lankton, a Memoir.” Artnet Magazine. January 27, 2007. Accessed May 2017. http://www.artnet.com/magazineus/features/morton/morton1-26-07.asp. Nastac, Simona, and Massimo Grimaldi. “Unalterable Strangeness.” Flash Art. July 27, 2016. Accessed May 2017. http://www.flashartonline.com/article/unalterable-strangeness/.